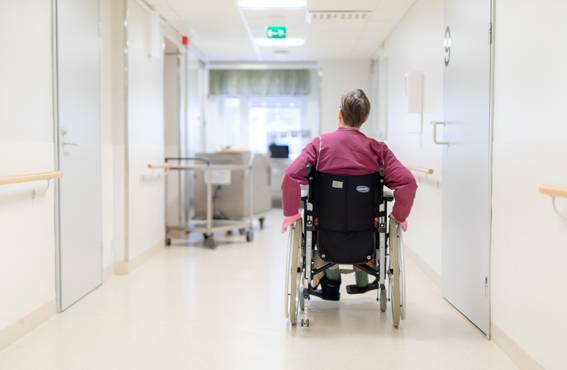 At the beginning of the decade, problems arising from physically heavy work were seen at the regional health care centres of Central Finland. Developing ergonomic working methods and investing in patient handling devices significantly improved the daily life of the nurses as well as of the patients. People are hurrying to and fro at the bed ward of the regional health care centre of Laukaa in Central Finland. All 22 patient places are occupied, and the corridor is crowded with lunch-time traffic. Patients have various ways of getting to the dining hall. One can see walking sticks, crutches, rollators as well as wheelchairs. 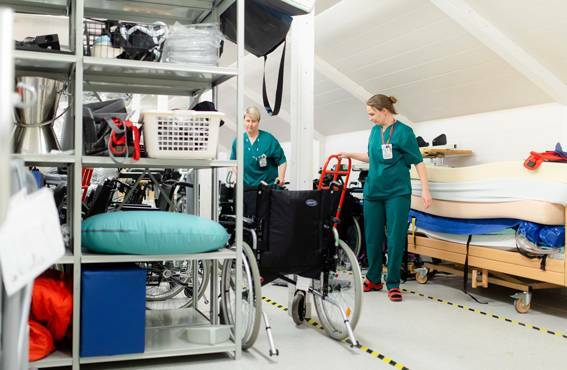 Practical nurse Mia Huotari and nurse Liisa-Lotta Heinonen go on rounds of the patients’ rooms and help them with whatever personal needs they have. The needs of the patients vary greatly because of the wide spectrum of patients at the ward. Some patients are recovering from surgery, some have infections. 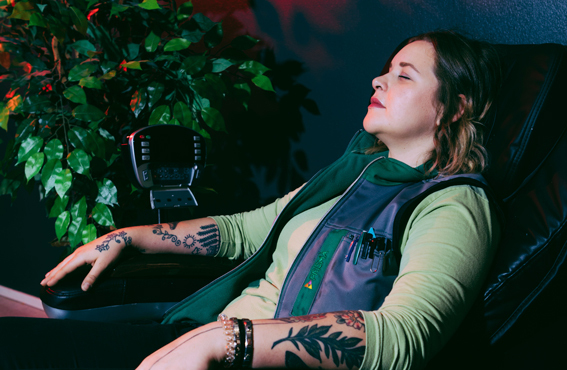 There are also some patients who have addictions and mental disorders, as well as patients needing palliative terminal care. – Our basic principle is to support the patients’ independent initiative, and whenever possible, passive lying in bed is minimized. The idea is that all patients who are able have their meals in the dining room, and go to the toilet independently. This is a big change from the previous practice. Earlier the patients spent long periods of time in bed. They were not encouraged to be active and independent, too much was done for them, says Huotari. When a patient is supported to be more active and to move about, his or her recovery is much faster, and problems arising from passiveness, such as bed sores, are reduced. The activities linked to the daily routines also replace partly the separately organized rehabilitation. In the dining room, the posture of the patients eating at the table is better than in bed, and at the same time they have more social contacts. The physical capacity of patients is assessed carefully when they come to the ward. The goals of rehabilitation and the methods used to reach the goals are recorded on cards kept in the patients’ rooms. This makes it easy to check the information when the patient is being treated. Both Huotari and Heinonen emphasize that patients are not left to cope alone. 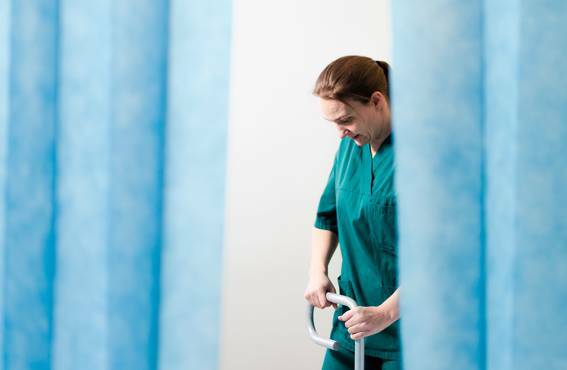 When needed, nurses help the patients to get out of bed and to move about. Upon arrival to the ward, each patient’s physical capacity is assessed carefully. It is also determined what kind of help and what devices are needed. Numerous rollators and wheel chairs are available at the ward, so the patients get personal devices during their entire stay at the ward. – We register the patient’s functional capacity, his or her need for help and for any devices and other equipment in our patient data system, and this information is up-dated if the patient’s condition changes. Information about the patient’s rehabilitation and physical capacity are recorded also on cards in the patients’ rooms. In this way the status of the patient can be easily checked while he or she is being treated, Heinonen explains. At Laukaa, the change has improved not only the well-being of the patients, but also that of the personnel. Previously the patients were helped out of bed by lifting them under the arms and pulling from the pyjama pant leg. The lifting was done using one’s own body and applying force. There were a few patient transfer devices at the ward, but the nurses had not been trained to use them, so they were not used much. Now there are more devices, they are easily accessible, and all the nurses know how to use them. Mostly the patients are not lifted, they are only given support in moving. Video-recording was used to assess the level of work loading in the wards. – Everything starts from being familiar with your own physical capacity, and being able to make use of natural body movements in the transfer of patients. When needed, patient handling devices can be used to increase or lessen friction. When helping in the right way, one can decrease one’s own work loading, and make the manoeuver also more pleasant for the patient, Heinonen explains. For example, a patient who is able to support himself on his legs and feet for a moment, can be transferred from bed to a wheel chair quite easily with the use of light devices. – The patient sits on the bed and his or her feet are placed on the floor. A plastic slide is slipped under the patient, and the other end of the slide is placed in the wheel chair. With the help of the slide the patient can be slid into the chair. Our new patient beds are equipped with movable support handles which the patient can grip during the transfer. 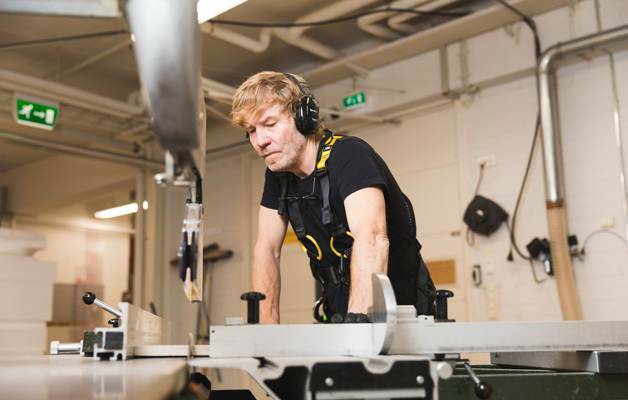 If the transfer requires more assistance, a patient turner – a turning aid – can be used, or even sturdier active or passive lifting equipment, for instance patient hoists, says Heinonen. 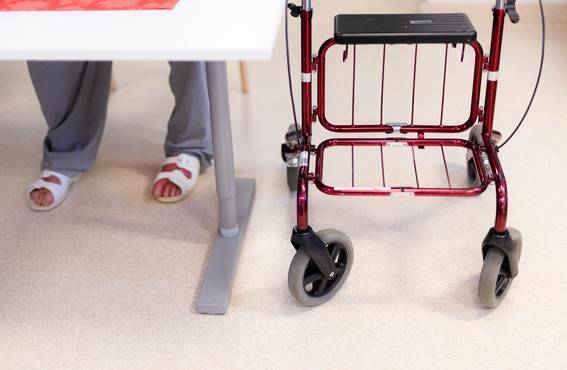 The patients at Laukaa are encouraged to move about independently. They are given the devices they need for their personal use during their entire stay at the ward. A change in the ways of operating at Laukaa was started during 2012–2014. The ‘TURO’ development project aimed to improve the well-being and safety skills of employees who work with elderly and disabled patients. 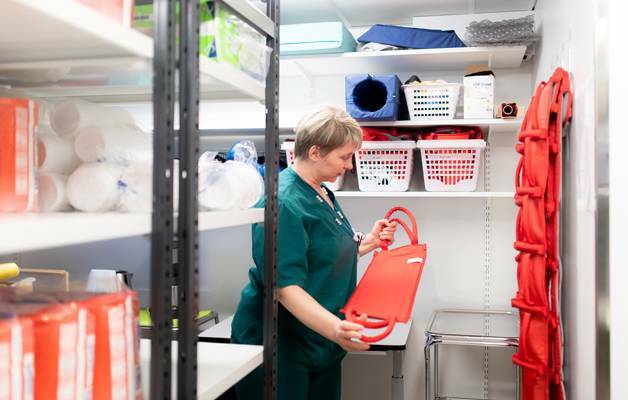 The five bed wards of the regional health care centres, belonging to the health service district of Central Finland, took part in the TURO project led by the Vocational University of Jyväskylä. In addition to Laukaa, the bed wards of Keuruu, Joutsa and Konnevesi took part in the project. 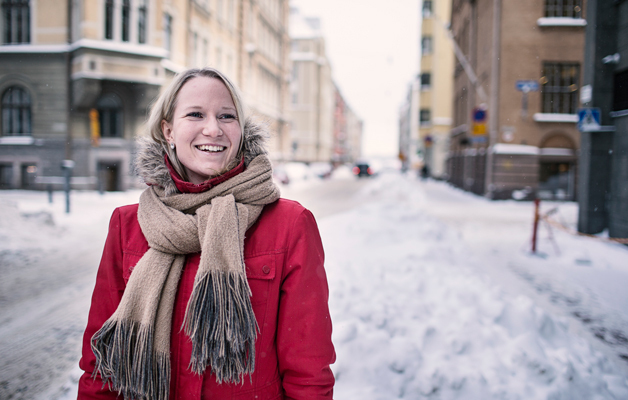 Project leader Anja Tanttu from the well-being unit of the Vocational University of Jyväskylä says that the initiative came from the regional health care centre which was having problems related to work ergonomics. Tanttu decided to tackle the problem, together with supervisors from the regional health care centre. Funding for the project was obtained from ESR (EU Regional Social Development Fund). 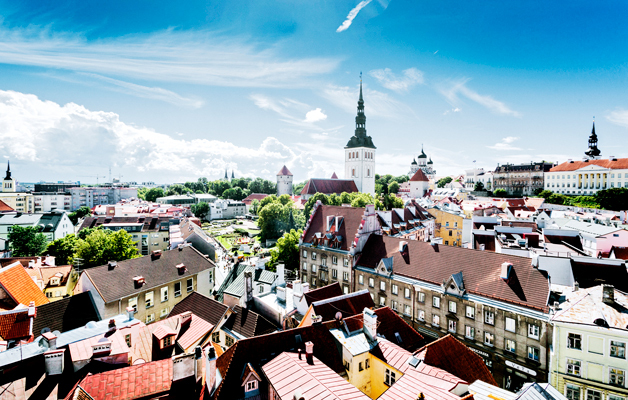 – The Regional Health Care Centre of Central Finland, which had been founded a year earlier, and five health care stations were merged into one organization. There was a need to standardize different ways of operating, and to develop supervisory and treatment practices. First a project group, which had a central role throughout the project, was set up. 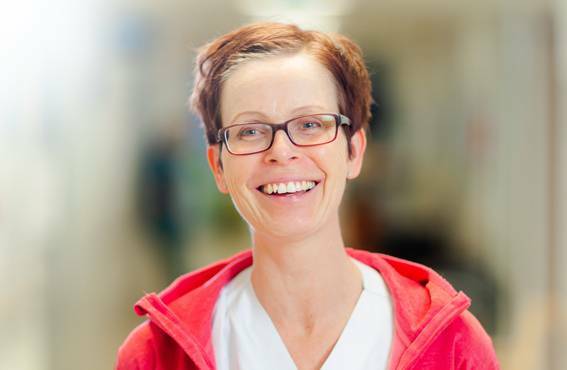 The group included the head nurse, supervisors of the health care centres, a patient safety coordinator, an occupational psychologist, as well as a number of specialists from the Vocational University of Jyväskylä, describes Tanttu. The project group reviewed and analysed the contents of work tasks, and proposed possible ways of lightening the work and improving ergonomics. Video recording was used to assess the loading of the work tasks in the wards. 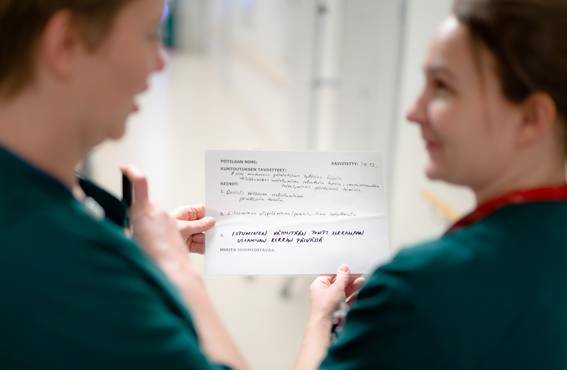 When the problem areas in nursing work were determined, the Vocational University of Jyväskylä organized training for the personnel and supervisors. The training included for instance ergonomic theory, assessment of the functional capacity of patients, as well as safe patient handling techniques and equipment. – The process starts from the assessment of the functional capacity of the patient coming to the ward. Is the patient able to move about independently or does he or she need assistance? What devices are possibly needed? It is possible to activate patients in many ways, but prior to the project many nurses were not aware of these methods, Tanttu remembers. Tanttu praises the comprehensive efforts of the regional health care centre in implementing the TURO development project. The entire personnel, including the management team, took part in promoting the project. The head nurse, as well as supervisors were committed and participated actively. Their dedicated cooperation played a big part in the success of the project. Head nurse Satu Sonkamuotka says that as a result of the TURO development project, the employees have significantly fewer sickness absences due to musculoskeletal disorders. Two voluntary employees were selected from each bed ward to provide assistance with ergonomics. Tanttu says that this made sure that the action models developed in the project would become everyday practice in the work communities. All ergonomics assistants were given training in ergonomics, and their job description was moulded to suit the needs of their own unit. In addition to their work as nurses, Huotari and Heinonen acted as ergonomics assistants at the Laukaa bed ward. Together they are responsible for the acquisition, maintenance, cleaning and storing of the patient handling devices and other equipment. They give advice to the employees in the use of the devices and in questions related to ergonomics. In addition, they give ergonomics demonstrations, instruct new employees, and solve ergonomics problems that come up in the daily work at the ward. – We started by lightening the heaviest work tasks, and gradually proceeded to solving less serious problems. When the methods of transferring patients had been changed, we focussed on demonstrating better work postures for instance in the treatment of varicose ulcers in legs. It was easy to get our workmates to accept the new methods because they made the work much lighter, says Huotari. The purpose of ergonomics is to eliminate friction between work and the worker. 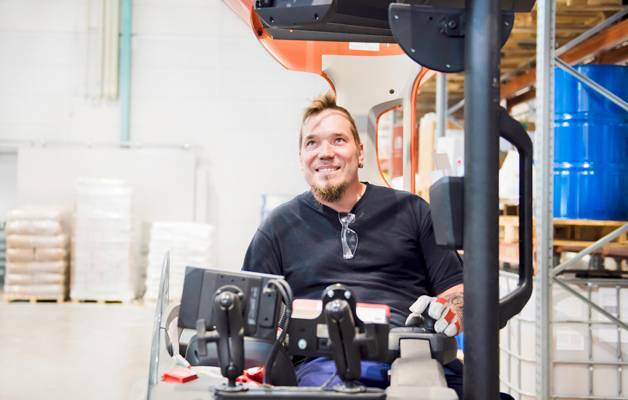 In the beginning, the tasks of ergonomics assistants took up a lot of time, as Huotari and Heinonen spent a large portion of their working time in training as well as in acquiring new patient-handling devices. After the initial stage, however, their work load has become lighter. Both nurses say that they now use only about 10 days a year in their tasks as ergonomics assistants. This time includes also ergonomics training which they arrange for other wards and organizations, ergonomics demonstrations and consultations. – Liisa-Lotta and I also have ergonomics training certificates, and we have organized training courses for the bed ward staff of Keuruu and Joutsa health care centres. In future, I would like to focus even more on training activities, says Huotari. 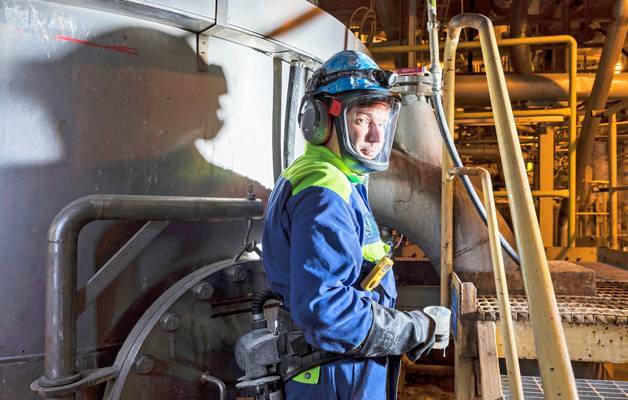 Ergonomics assistants Mia Huotari and Liisa-Lotta Heinonen emphasize the importance of having had the strong support of their supervisors and the management during the entire project. That has helped to implant the new action models in the organization. Practical nurse Sanna Mäkinen is recording patient data in the corridor of the bed ward. Her computer is placed on a movable computer desk equipped with wheels. Mäkinen has adjusted the desk so that she can work standing up, as sitting is not good for her sore back. Mäkinen praises the improvements brought about by the TURO development project. She is certain that without the new working methods taught in the ergonomics training and the new devices she would no longer be able to do her work. She still has problems with her back, but because of the better ergonomics Mäkinen has avoided sick leaves. – Along with the changes, my work is now much lighter. I have learned to use the patient-handling devices effectively and to pay more attention to my work postures. If challenges come up in the work, I can get help quickly from the ergonomics assistants at my ward, says Mäkinen. The head nurse of the Laukaa bed ward, Sonja Sonkamuotka, has noted that the employees have much fewer sick leaves caused by musculoskeletal problems after their work ergonomics improved. They have significantly fewer neck, back, hand, and hip symptoms. According to Sonkamuotka, the ergonomics project has motivated the employees to look after their well-being and muscle fitness also during their free time. – The TURO project has had a huge impact on our ward. I can’t even remember when we last had an accident caused by patient transfers. As a supervisor, I feel safe when I get help in ergonomics from our well-trained ergonomics assistants. They also know how to teach correct and healthy work habits to substitutes and new employees, says Sonkamuotka. She believes that the TURO project has significantly improved also the well-being and safety of the patients. At the same time, the attitudes of the nurses, the patients and their families have changed in regard to the importance of maintaining the functional capacity and independent initiative of the patients. – The nursing staff have started to explain to the patients and their family members why the maintenance of functional capacity and promotion of initiative is so important. This has made it easier to apply the rehabilitative approach in practice, says Sonkamuotka. Rollators, wheel chairs, and other devices are kept in their own specified storage places. It is easier for the personnel to work and the patients to move about when the equipment are not kept in the corridor. Lecturer Susanna Järvelin-Pasanen from the University of Eastern Finland says that work ergonomics is a complex entity. Good ergonomics can improve people’s safety, health and well-being. 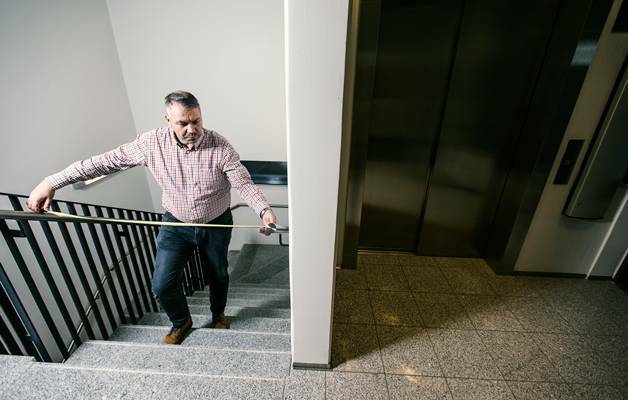 – Järvelin-Pasanen tells that ergonomics professor Veikko Louhevaara has summarized the purpose of ergonomics as being the elimination of friction between work and the worker. According to Järvelin-Pasanen, work ergonomics is composed of three sub-areas. Physical ergonomics means moulding work and its demands to a person’s physical capacity. Cognitive or brain ergonomics refers to the compatibility between a worker’s mental capacities and the demands of the work. The third sub-area is organizational ergonomics, which includes for example the organization of work, working-time solutions, and developing leadership practices and interaction within the work community. The development of these aspects in the work community also supports measures which further improve physical and cognitive ergonomics. 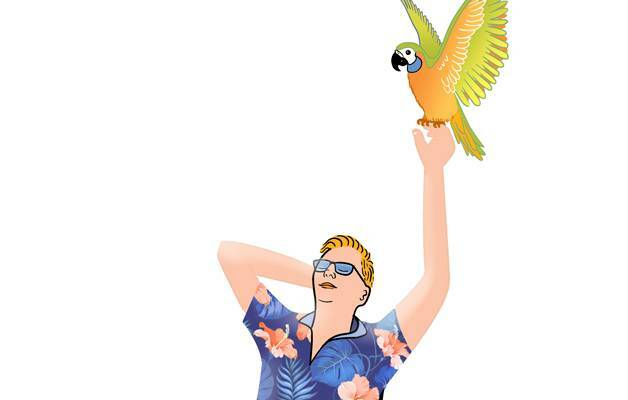 – Ergonomics should be seen as a holistic entity, because the human being is a psycho-physical entity. The sub-areas of ergonomics influence each other, and loading factors cause different symptoms in different individuals. Heavy physical work can cause musculoskeletal symptoms to one worker, and mental symptoms to another, reminds Järvelin-Pasanen. Liisa-Lotta demonstrates how to alter the position of the support handles that are integrated into the new hospital beds. The patient is able to get a good grip on the handles and the best possible support when getting out of bed. 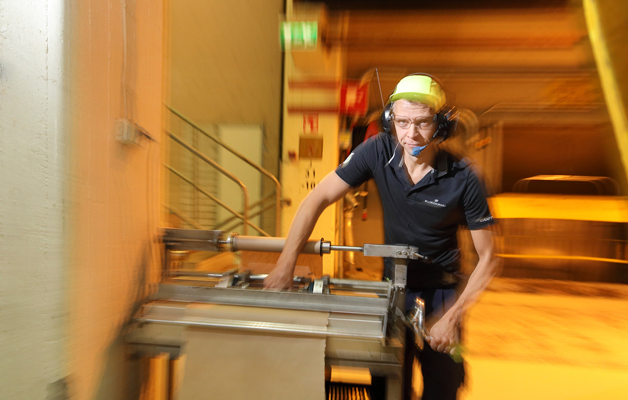 Järvelin-Pasanen is certain that work ergonomics has continuously evolved in a positive direction. During the 1970s and 1980s many physical risks and loading factors were eliminated. In the 1990s and 2000s more attention is paid to stress and social loading factors. – A large amount of research data is available on loading factors and how to prevent them, and work communities are well aware of the main occupational safety risks. Safety is also monitored closely at workplaces. Nevertheless, the problems related to ergonomics vary from one time to another. When certain problems are solved, others appear. Nowadays, challenges arise from the loading caused by information work, stressful working times, as well as problems caused by poor indoor air, sedentary work, telework and travelling. Of course, some traditional problems related to physical work ergonomics still remain with us. Järvelin-Pasanen sees some positive sides, but also challenges, in the multi-site work that has become prevalent during this decade. – It’s a good thing that when you walk from one work site to another, you get to change your posture. It’s essential that when a work site is used by several people, there is a wide range of adjustment possibilities. When the work is done in different sites, people don’t have a traditional work community. This kind of situation is not suitable for everybody, Järvelin-Pasanen says. Järvelin-Pasanen says that organizations would be wise to invest in the prevention and early detection of ergonomics problems. There would be less problems if ergonomics specialists would be involved in designing the work processes and work environment. Also the internal communication in organizations needs to be open and efficient. – The employees at workplaces have tacit knowledge that would be valuable in the development of ergonomics. People have experience-based knowledge of what weakens or improves safety at work. This knowledge does not always reach the management. That is why supervisors should be able to convey information in both directions in an organization. Järvelin-Pasanen points out that the motivation to plan and implement work ergonomics should come from within the organization. When needed, the occupational health service can provide information and support. – Workers, supervisors as well as the management, all have their responsibilities. Ergonmics awareness and correct work postures should be taught already to students in vocational institutes. Ergonomics specialists are also needed at workplaces to solve daily ergonomics challenges. Järvelin-Pasanen emphasizes that the promotion of ergonomics does not necessarily mean investing in expensive furniture and equipment. Even small steps can make a big difference. For instance, if a sedentary worker stands up, takes a few steps and does exercise stretches once in an hour, it would help a lot. According to chief psychologist Teemu Paajanen from the Finnish Institute of Occupational Health, cognitive ergonomics of work is in order when the demands of information processing are in harmony with the person’s cognitive capacity. Cognitions refer to the ability of the brain to process information, as well as different thinking processes, sensory functions, memory, learning and problem-solving. – Information processing is needed increasingly in all types of work. Cognitive ergonomics should be taken into account already in the planning of work. Especially short-term memory and attentiveness are loaded in hasty everyday work. Examples of cognitive ergonomics are for instance: facilitating the internalizing of information by adjusting the sound and lighting conditions in the environment, as well as supporting brain work by for instance reducing the amount of work and time pressure. The management and the whole work community are responsible for ensuring high-quality cognitive work ergonomics. Employees can improve their own cognitive work ergonomics also by themselves. – Avoid jumping from one thing to another, and concentrate longer on one item at a time. Avoid unnecessary interruptions and try to eliminate disturbances. For example, sounds and movements in the environment easily catch your attention. Also unclear instructions or trying to remember unimportant details can cause additional unnecessary loading on the brain, says Pajanen. Loading of the brain can also be reduced by making sure that the information needed for the work is found easily in the everyday setting. Project codes and passwords can be left to the computer to remember.